But what does it matter? 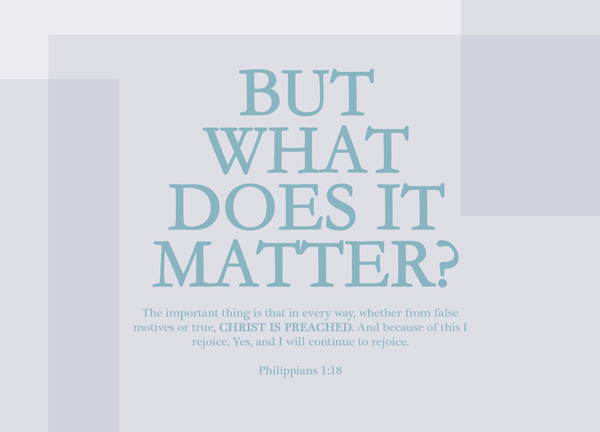 The important thing is that in every way, whether from false motives or true, Christ is preached. And because of this I rejoice. Yes, and I will continue to rejoice. The Epistle to the Church of Philippi is one out of four of Paul’s prison epistles, referring to the fact that he wrote them while imprisoned. This context is clearly and heavily referenced in Philippians 1, as he talks about his chains [Phil 1:7, Phil 1:13, Phil 1:14]. We need to understand what happened – because of Paul’s imprisonment, his critics are out now preaching the gospel out of envy and rivalry [Phil 1:15], out of selfish ambition. The phrase selfish ambition here suggests getting support for their own factions. Now that Paul the big name preacher is out of the way, many ill-intentioned preachers have jumped out in an attempt to fill his empty seat and sweep up the lingering support he had. And trouble was stirred up, along the way. It was this context that led Paul to make an awe-inspiring declaration in verse 18, one that speaks volumes about what was number one on Paul’s priority list: the spreading of the gospel. In today’s study we will examine the depth behind this declaration and asks ourselves indeed, what does it matter? But what does it matter? – What an amazing statement and a bold declaration by Paul! Indeed, it is this statement that I’ve held on to on many occasions when it is easier for me to get distracted and let my faith be stumbled. In just these few words, Paul reminds us that it is of little importance. Paul questions us why are we so flustered about it. Paul asks us why should we be affected by it. About what? Preachers who preach with ill-intentions? False motives? Dark secrets? Huge Conspiracies? Money issues? Irresponsible lives? Sully our names and insult us? Steal and defect from us? All these are unfortunate, yes, and not godly indeed – but why should we fluster over such matters? There are more important things in life than the flaws and the imperfections of others. As human beings, it is natural and instinctive that we see, clearly, the flaws and faults of the people around us. The closer they are to us, the harder we struggle to deal with their faults. Sometimes it gets to a point where we suffocate ourselves over their imperfections, and we forget that we’re not only judging them, but also placing ourselves on a pedestal. There are more interesting things to engage ourselves in life. The important thing is that – Paul brings us back to the focus, to the priority, to what’s most important. Don’t fret over the minor stuff. Don’t concern yourselves over the hearts of others. Not that it is not important to know what’s going on, but there isn’t a need to make it out into a disaster. Turn back to what’s most important. Turn back to God. Turn back to the word of God. in every way, whether from false motives or true, Christ is preached – Our God is an unlimited God. He doesn’t speak to us only through the apostle Paul. He doesn’t only use good people, outstanding Christians without a blemish in life. In every way, whether it is a way that we can imagine or not, whether it is something we expect or not, God can reach out to the people. So even if the preacher’s hearts weren’t pure, but he teaches the gospel, Christ is still preached. He is still preaching the word of God – even if he does it for fame, for repute, for money – whatever. God knows, and God will deal with him. We just need to focus on the fact that, hey, the gospel was preached! Hurray! Nothing is more important than the gospel being taught. Some people may point to Galatians and question Paul for his ‘inconsistency’. In Galatians, Paul famously reproached the false preachers to be eternally condemned [Gal 1:9]. Why not overlook that? The difference is, the preachers that Paul spoke about in Philippians simply used Paul’s imprisonment for their own benefit, and preached the true gospel with ill motives. Yet, they were still preaching the true gospel. However, the preachers mentioned in Galatians preached a different gospel – they are false preachers, and Paul does not mince his words when it comes to them. When these false preachers ‘preach’, there is no true gospel, and Christ is not preached, and God is not glorified. Hence, it matters! Paul clarifies in Galatians 4:18 – It is fine to be zealous, provided the purpose is good, and to be so always, not just when I am with you. And because of this I rejoice. Yes, and I will continue to rejoice – Going back to Philippians and the preachers with false motives, but yet still preach the true gospel – Paul declares that just for the fact that Christ is preached, he rejoices, and he will continue to rejoice. There is no need to think about other things, or be bitter about the way people do things or the reason why people do what they do. Even in such difficult circumstances, we can still rejoice. For the fact that Christ is being preached, is a matter worthy of our greatest joy. In our everyday life, we may come across pastors and ministry leaders or co-workers whom perhaps serve just to look good, just to boast, just to be praised by others. Done in moderation and it’s cute and even funny; done obsessively and it’s annoying and infuriating. It discourages those who serve with a true heart, and work hard and long without gaining half the appreciation that those people who care more about appearances do. It is bitter. It is unfair. But, Paul argues, why does that matter, as long as Christ is being preached? When you face a problem in the future, think if God is glorified, and if Christ is being preached. If yes, barring any obvious scenarios like a life being threatened or an intentional false teaching of the Bible; then it really doesn’t matter. God will account for it himself, and we can rejoice solely because more people get to hear about the word of God.